Welcome to Shepherd of Peace. Join us for worship and Bible study this Sunday! 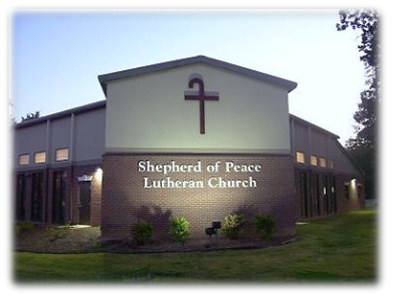 There's a place for you at Shepherd of Peace! Shepherd of Peace exists to praise and glorify God. This happens when we are faithful in preaching the Word of God, administering the Sacraments according to Christ's institution, and reaching out to others with the Gospel of Jesus Christ, in promoting growth in discipleship, and in performing acts of self-sacrificing love to all people in Christ's name. We are part of the Lutheran Church Missouri Synod. Learn more about the beliefs and work of the LCMS.